Get a Google Cardboard or similar device, for example from here. Open a #Holo in your smartphone’s mobile web browser (preferably Google Chrome). For a start, we would recommend this good-looking one. Enable the sensor and cardboard modes of the HoloPlayer (see the red box in the image below). Tap on each icon to change the mode. Put your smartphone into your cardboard device. The tiny dot at the center of the screen is for clicking objects. Place it on an object for a short amount of time – until the loading circle is completed – for clicking and triggering an action. This way you can “walk around” in your virtual tour. Please install a compass app. Move and turn around by 360 degrees to see if everything is working properly or if there are problems with you sensors. If there are problems, please reset your compass according to Google’s tutorial. 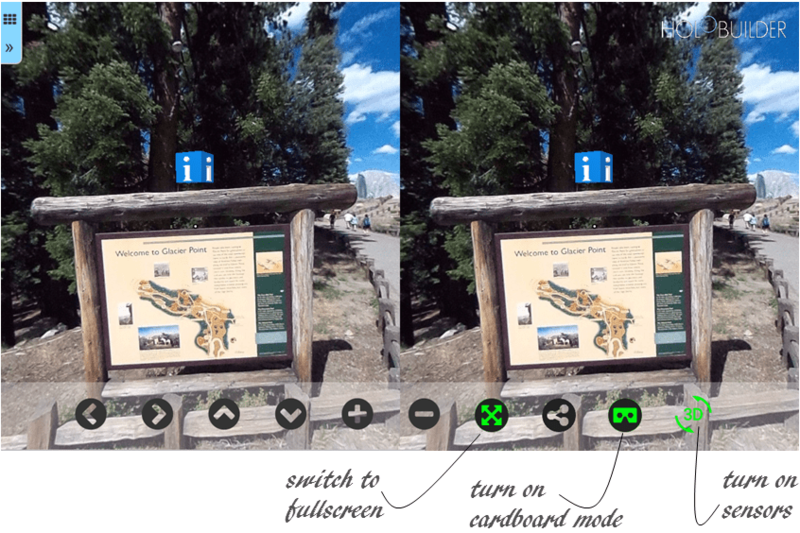 Now everything should work properly and you should be able to enjoy your #Holo in your Google Cardboard. If you experience other problems or have any further questions concerning the use of the cardboard mode, please write us an email. This entry was posted in HoloBuilder Tutorials and tagged 360°, Cardboard, google, head-mounted display, HMD, HoloBuilder, HoloPlayer, photo sphere, photospheres, virtual reality, virtual tour, VR. Bookmark the permalink.